I stumbled across this while web-wandering last night: advertising material to accompany the UK theatrical release of BUCK ROGERS IN THE 25th CENTURY. I think this is a set of newspaper advert designs intended for insertion into local papers. 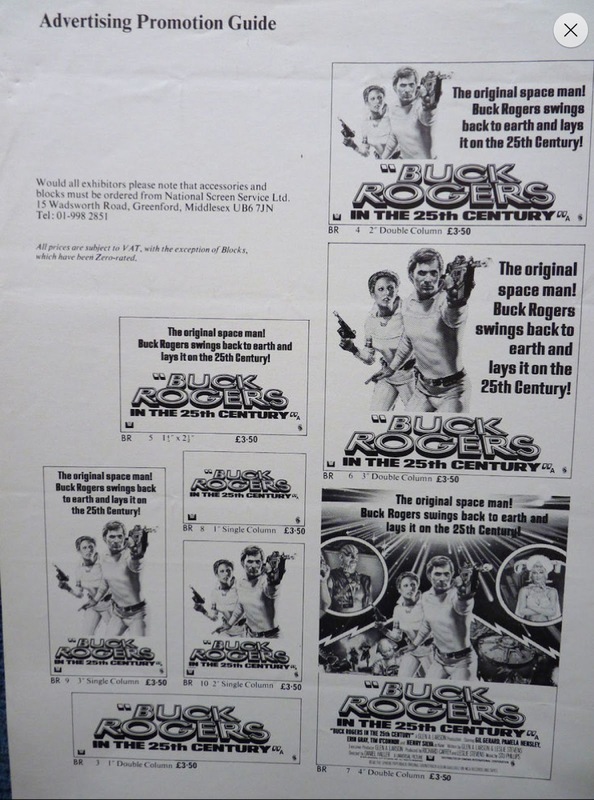 Local cinema managers (exhibitors) could select the design they wanted to use and and then buy the "block" which, in the pre-digital age, featured the artwork to be used in the advert. That "block" would go to the paper's printer and - voila - local advert inserted. The single-column/ double-column widths refer to the widths of the columns of text on a newspaper page. Two being wider than one. Of course. The artwork is the (very) frequently used piece created to promote the movie. 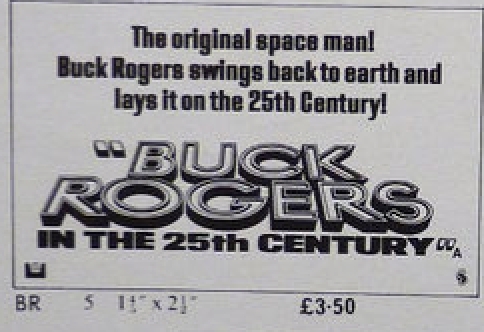 It turned-up everywhere on publicity and merchandising (including the sticker album and Mego's BR action figures). It seems weird to think, in this age of tightly-controled global movie marketing, that promotion (or lack thereof) would be in trusted to the whims of the local cinema although, of course, movies still received national press (including comics) and TV support.